In October 2008, Shanghai, regarded as China’s most cosmopolitan city, was shuddering from the aftershocks of a Wall Street earthquake. Lehman Brothers had collapsed a few weeks prior, battering the city’s benchmark stock index, down 70 percent since the start of that year; local bourses had lost $3 trillion in value. As exports shrivelled, the port became a marine parking lot. By early 2009, the government estimated one in seven migrant factory workers had been laid off. Shoppers could see them on evening strolls, prostrated on the benches of East Nanjing Road: a slumbering threat of political unrest. Some in Beijing argued it was time to separate China’s fortunes from the United States. Over-reliance on U.S. consumer spending, reinforced by a repressed currency, had coddled manufacturing at the expense of local consumption. Confidence in Washington’s financial regulation also now seemed ill-advised. Some local financial institutions, having been allowed to start trading New York stocks in 2006, now faced massive losses, and it looked like fancy American derivatives were to blame. The experience soured a generation on free markets. Over the following decade, Beijing tried to cut its dependence on American consumers, capital markets, and currency. Perhaps not hard enough. Part of the reason for official complacency was the success of the government’s 4 trillion yuan ($580 billion) stimulus package. In China, there was no banking collapse, no wave of defaults, no proletarian revolt; GDP growth stayed over 9 percent. Surplus labour was put to work building railways and airports. Capital flight was arrested, and the central bank locked up the exchange rate. Many believed Beijing had proved its model superior. Printing money proved addictive, however. Non-financial corporate debt rose sharply, touching $20 trillion at the end of 2017, according to Bank for International Settlements data: 160 percent of GDP. Tackling that is a challenge now complicated by the need to hold funding costs down to offset the impact of Trump’s tariffs, even as the Fed steadily hikes rates. Chinese officials will also regret stalling the campaign to promote the yuan. According to SWIFT data, the currency of the world’s largest trading nation was used for less than 2 percent of international payments in August, three-quarters of those in Hong Kong. Unable to fundraise overseas in their own currency, Chinese corporates have become major dollar borrowers. Even President Xi Jinping’s Belt and Road initiative is being funded in part with dollar bonds. The yuan has now fallen back to nearly 6.9 per dollar – below the level it was locked into in 2008. Domestic stock markets seem stuck in a time warp too. The Shanghai composite index remains down around 50 percent from its pre-crisis peak, where the S&P 500 has nearly doubled. With key reforms to market architecture on hold, Chinese equity and fixed-income instruments don’t reliably track economic growth or corporate performance. Nor are they sufficient to meet China Inc’s funding needs. So serious investors remain wary of them, as do Chinese technology stars like Alibaba, which listed in New York. The system thus remains over-dependent on bank loans, as it was in 2008. Officials can take comfort in their cultivation of internal demand; it is now a far bigger driver of growth than exports, and has provided a thick economic cushion thus far. But consumer confidence is being tested, and falling share indices suggest punters don’t believe they are immune. 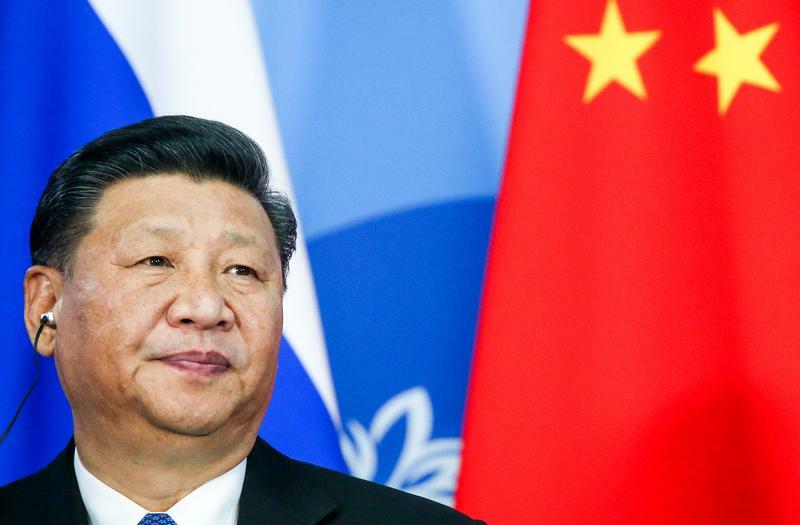 Regardless, without robust equity and bond markets, and a currency worthy of its trading stature, China will struggle to insulate itself from side-effects of U.S. monetary and trade policy. And it hasn’t built them. Regulators might have done so when conditions were accommodative: now it will be harder, and riskier. Trump’s trade war is based on questionable economics, but if he can rattle investors in the Middle Kingdom this easily, it’s hardly the American model that is to blame. Chinese President Xi Jinping attends a signing ceremony following the Russian-Chinese talks on the sidelines of the Eastern Economic Forum in Vladivostok, Russia September 11, 2018. China's benchmark CSI300 stock index has yet to regain pre-crisis levels, and is down around 40 percent since October 2007. The S&P 500 has nearly doubled over the same period. The renminbi, also known as the yuan, was included in the International Monetary Fund's Special Drawing Rights currency basket with a weighting of 11 percent after lobbying from Beijing. IMF data shows the yuan made up only 1.25 percent of global reserves at the end of the first quarter of 2018. Data from SWIFT shows the yuan was used in 1.2 percent of international payment transactions in August 2018, but over three-quarters of those payments occurred in Hong Kong, which is a special administrative region of China.